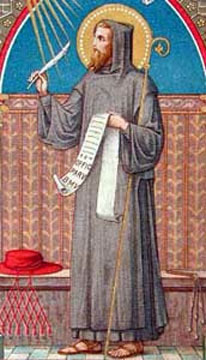 Pietro Damiani, one of the most celebrated ecclesiastics of the 11th century, was born at Ravenna, and after a youth spent in hardship and privation, gained some renown as a teacher. About 1035, however, he deserted his secular calling and entered the hermitage of Fonte Avellana, near Gubbio; and winning sound reputation through his piety and his preaching, he became the head of this establishment about 1043. A zealot for monastic and clerical reform, he introduced a more severe discipline, including the practice of flagellation, into the house, which, under his rule, quickly attained celebrity, and became a model for other foundations. Extending the area of his activities, he entered into communication with the emperor Henry III, addressed to Pope Leo IX in 1049 a writing denouncing the vices of the clergy and entitled Liber Gomorrhianus; and soon became associated with Hildebrand in the work of reform. As a trusted counsellor of a succession of popes Pietro was made cardinal bishop of Ostia, a position which he accepted with some reluctance; and presiding over a council at Milan in 1059, he courageously asserted the authority of Rome over this province, and won a signal victory for the principles which he advocated. He rendered valuable assistance to Pope Alexander II in his struggle with the anti-pope, Honorius II; and having served the papacy as legate to France and to Florence, he was allowed to resign his bishopric in 1067. After a period of retirement at Fonte Avellana, he proceeded in 1069 as papal legate to Germany, and persuaded the emperor Henry IV to give up his intention of divorcing his wife Bertha. During his concluding years he was not altogether in accord with the political ideas of Hildebrand. He died at Faenza on the 22nd of February 1072. Damiani was a determined foe of simony, but his fiercest wrath was directed against the married clergy. He was an extremely vigorous controversialist, and his Latin abounds in denunciatory epithets. He was specially devoted to the Virgin Mary, and wrote an Officium Beatae Virginis, in addition to many letters, sermons, and other writings. His works were collected by Cardinal Cajetan, and were published in four volumes at Rome (1606-15), and then at Paris in 1642, and at Venice in 1743.